Crazy Tourist | Crazytourist.com - Page 16 of 16 - The true-life diary of a lady in Los Angeles who trips a lot. After years of international travel I have discovered the best way to fly with a knitting project is to utilize the extremely high-tech Ziploc baggie technology. Gather together the yarn and tools you will need for one project at a time and stick it together in a clear gallon or quart size Ziploc baggie. It’s easy for anyone to look at during a security check and simple to keep organized while traveling. If you’re an out-of-sight/out-of-mind person like me, you probably already have every project in a baggie. It’s the only way I ever remember what I’m making! One of the upsides of packing only a project’s worth of yarn in the Ziploc baggie methodology is that you don’t risk contaminating all your stash and supplies if you run into a problem while traveling. I learned this the hard way when I stayed at an unvetted place in Paris that may or may not have had the dreaded bug. You know the one — it’s the bug all travelers fear. That’s a post for another time my friends. I lost two skeins of good yarn and a few small tools but nothing like what I would’ve lost if I had brought my whole knitting bag. Packing a travel knitting kit is something you can do in advance. I travel a fair amount and I like to have a little travel bags pre-packed and available for airplane knitting. It’s my way of being prepped for travel and simultaneously shopping in my own stash. My in-flight knitting projects are usually hats or armwarmers, with the occasional scarf thrown in for spice. And of course these little project bags are easy to grab any time I’m going to be standing in line or waiting and want something to do with my hands. Optional snack-size bags for even deeper levels of OCD. All my knitting neuroses are carefully packaged for travel. Pattern if needed. I wrote mine on a small card. If you want to be hyperorganized, put your tools (scissors, markers, needle, crochet hook) in a snack size baggie and drop it into the bigger bag. You are ready to fly! This knitting is ready to fly! It’s cold in Paris in February and the Captain is going to need a hat or four to keep his ears warm. We will be staying in the 1st Arrondissement, the inspiration for the hat’s name. This is not only our first trip together abroad, this is also the first ever boyfriend knitting. And I’m not just talking about the first knitting for this boyfriend, I am informing you that in all of the time I have been knitting I haven’t made anything for a single guy I’ve gone out with. Partially because none of them deserved it and partially because who has time for that when you break up in a few weeks anyway? Now that we are in year number two I guess I got reckless and hopeful. And here I am knitting this man a cashmere beanie before we get on a plane to go to Paris. One 109-yard skein DK weight yarn — I used Noro “Cash Island” cashmere blend from my stash, one skein (yarn profile on Ravelry) It’s on the heavier side of DK, between a 3-4 weight. Cast on 88 stitches on size 8 16″ circular needle. Join the stitches, making sure stitches are not twisted. When your hat measures about 6.5″ from the cast-on edge, begin your decreases. First, place a marker to denote the beginning of the rounds. This marker should be different from all the other markers. It is a special marker. Mwah. Next, you will place a marker along the round denoting every decrease. For this pattern, you will work 11 stitches, place marker, work 11 more. Continue until all markers are placed and you are back at The Special Marker. My marker method is about as foolproof as you can get for decreasing a hat. Once you have your markers in, simply make your decrease on the two stitches before each marker. That means you knit or purl until you see a marker and work the two stitches before the marker into a decrease (either knit or purl them together.) You can also decide to do it after each marker. I like doing it before. We are all individuals! Do what feels right! For this hat you will either decrease by knitting two stitches together or by purling two together. I’ve been making hats like this forever and now I know every time I see a stitch marker to decrease the two stitches before the marker. It’s a way for me to be able to knit and watch TV at the same time. Stop the K-1 P1 stitch and begin knitting all stitches in the round, which creates a flat stockinette top. Place a stitch marker to denote the beginning of the round that is a different color or different kind from the rest of your stitch markers. Then place one marker every 11 stitches. Next round: Knit 1, K2tog, removing markers as you go. You should have 16 stitches on the needles. Cut the yarn leaving a tail of about 10 inches. Thread yarn tail through a large-eye needle. Bind off with the needle by threading the yarn through all stitches and tying off. Don’t report me to the knitting police but I tie a knot. Weave in all ends. Be sure to weave in the yarn nice and tidy, this beanie is completely reversible and in my experience manly men such as the Captain do not search for the right side wrong side before putting it on! “Decrease in pattern” is a fancy way of saying try to keep the K1P1 pattern going even as you decrease. I usually do this by keeping my K1P1 pattern going until I get to the two stitches I need to combine into my decrease stitch. At that time I decide based on the stitch that follows the stitch marker if I should knit two together or purl two together. If the stitch that follows the marker (on the other side of the decreased stitches) is a purl, then I will knit two together. If the stitch that follows the marker (on the other side of the decreased stitches) is a knit stitch, then I will purl two together. I like doing this method because it mostly keeps the K1P1 pattern. But it is not exact and is not for everyone. You will have uncomfortable moments of purling together one knit and one purl stitch just after another purl. Trust me that it works out nicely in the end! Place a special stitch marker to denote the beginning of the round. Then place one marker every 11 stitches. You will decrease the two stitches together before each marker. First round: Work in K1P1 rib (knitting the knit stitches and purling the purl stitches) for 9, decrease 2tog, marker, repeat. Next round:Work in K1P1 rib (knitting the knit stitches and purling the purl stitches) for 8, decrease 2tog, marker, repeat. Next round: Work in K1P1 rib (knitting the knit stitches and purling the purl stitches) for 7, decrease 2tog, marker, repeat. Next round: Work in K1P1 rib (knitting the knit stitches and purling the purl stitches) for 6, decrease 2tog, marker, repeat. Next round: Work in K1P1 rib (knitting the knit stitches and purling the purl stitches) for 5, decrease 2tog, marker, repeat. Next round: Work in K1P1 rib (knitting the knit stitches and purling the purl stitches) for 4, decrease 2tog, marker, repeat. Next round: Work in K1P1 rib (knitting the knit stitches and purling the purl stitches) for 3, decrease 2tog, marker, repeat. Next round: Work in K1P1 rib (knitting the knit stitches and purling the purl stitches) for 2, decrease 2tog, marker, repeat. Next round:Work in K1P1 rib (knitting the knit stitches and purling the purl stitches) for 1, decrease 2tog, remove all markers as you go through the round. Cut the yarn leaving a tail of about 10 inches. Use the long tail of yarn to thread through a tapestry needle. Bind off with the needle by threading the yarn through all stitches and tying off. Don’t report me to the knitting police but I tie a knot. Weave in all ends. Be sure to weave in the ends tidily, this beanie is completely reversible and in my experience manly men such as the captain do not search for the right side wrong side before putting it on! There you go, two options for a quick hand-knit beanie. Wish us luck in Paris! When God opens a door or a window, a cat must walk through it. This also applies to drawers, pantry cupboards, file folders, boxes, and cabinets. And that is how one Frankie Perry found herself alone and wailing in the hall coat closet while The Captain made morning smoothies. The airplane-like roar of the Vitamix drowned out all sounds of meowing … for him. I was upstairs blow drying my hair and heard her yawling over the din all the way across the house. I walked downstairs and opened the coat closet and out she darted, angry and petulant and oh, wait, now I am hungry I have forgotten why I was mad. So I fed her and that was how we started Monday. Homemade stovetop popcorn is salty and crispy and crunchy and warm and if those aren’t all the adjectives you need to feel better about life than we just can’t be friends. Until recently I thought making popcorn in any way other than the microwave was terrifying. But stovetop popcorn is deceptively easy — if you use science. And also do the popcorn dance. Add 3T oil to a heavy-bottomed large pot. We use a basic soup pot. Add three (yes, 3) kernels of corn. These are your test pilots. Turn the heat to medium or just at the edge of medium-high. Put the lid on and listen. And wait. When you hear the test kernels pop, you are ready for the magic!! Add the 1/2 cup of kernels to your hot oil. Optional: We add a swoosh of popcorn salt at this step, too. Replace the lid. Then take the pan off the heated burner for 30 seconds. The Science Behind It: During this 30-second waiting period the kernels have the chance to bathe in oil and they all come to the same temperature. When you put them back on the burner in 30 seconds, they will now be evenly heated and your popcorn will be timed to pop in harmony and this reduces any chance of burning or scorching! The Dance: The Captain and I have developed a super cheesy dance where we count to 30 and sashay around each other in the kitchen while sing-counting down. We are a handful. After 30 seconds put the pan back on the heated burner. Keep the lid on the pan. Now you shake and pop. It may take a few minutes to bring all kernels up to popping temperature. During this phase (takes us about four minutes? Maybe more or less depending on the oil and the heat) begin to gently move the pan back and forth a little bit. Once you hear popping, begin to shake the pan or move it in a circular or vigorous back-and-forth pattern on the burner. Your corn will pop-pop-pop pretty much all at once. Once the popping starts it’s less than 90 seconds total to get all the kernels to pop. You may try to vent the lid a little in this stage to keep from having too much steam build up (makes crispier popcorn) but it took a few tries to get this maneuver perfected. The captain now holds the lid in one hand with it kind of turned up a tiny bit one edge while shaking/holding the pan itself with the other hand. I have not mastered that move. It’s fine both ways. Once most of your kernels have popped, take the pan off the heat right away. Pour into a big bowl and add salt, cheese, or your preferred toppings and enjoyyyyyy. 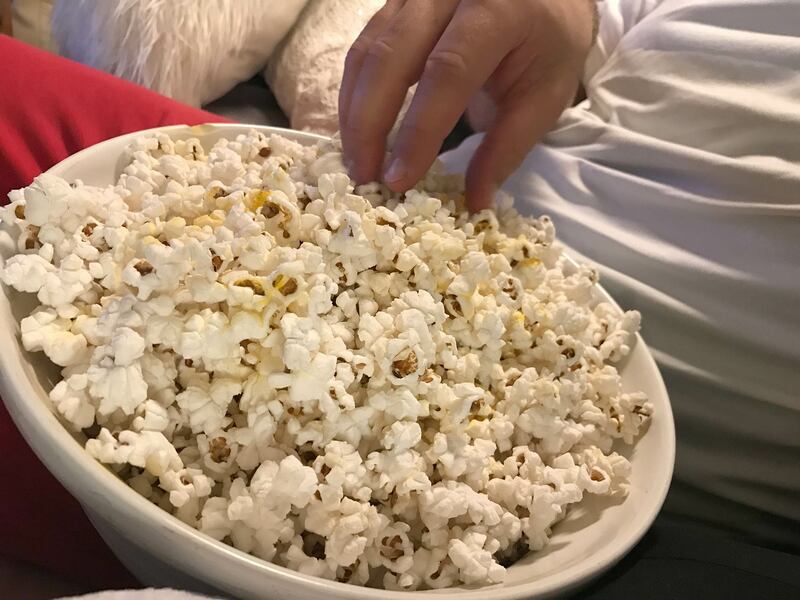 This makes a REALLY BIG bowl of popcorn, easily the size of a movie theater large but so much tastier! Makes enough popcorn for a small army, or two hungry adults. I am the most out of sight out of mind human being I have ever encountered. If you put something away and out my immediate field of vision, it is as if that thing never existed in my life. And I’m not just talking about stuff I find onerous to deal with (bills, legal documents, taxes) but it also applies to delicious things. One time I bought an entire big bag of Ruffles sour cream and onion potato chips — God’s gift to snackers — and put them in a cupboard below the cabinet because I was having someone over and didn’t want the sole contents of my pantry to be this one bigass bag of chips. TWO MONTHS LATER I opened that cabinet and oh wow you guys! Look what I found! I have chips!! I’m not even kidding one ounce right now. That happened. Today. Which is why I am writing this and also eating some slightly stale but delicious potato chips. So I know this is something I should probably address and think of ways to work with it/around it etc. but right now I gotta go because these chips aren’t going to enjoy themselves!! Hello blogging my old friend. I’ve come to blab with you again. Hi. You may remember me from such stories as, “My Jeep broke down” and “That other time my Jeep broke down.” Now I have less car trouble but more colorful cuss words for fellow drivers. I made a resolution to learn how to code my own website and then I drank a lot and cried into a CSS manual. How have you been? 2 days ago by crazyauntpurl Donut shirts in the wild! 2 days ago by crazyauntpurl Two half faces make a whole selfie!